La Colombe, ranked in the World's 50 Best Restaurants, uses local ingredients. Photo courtesy of La Colombe. 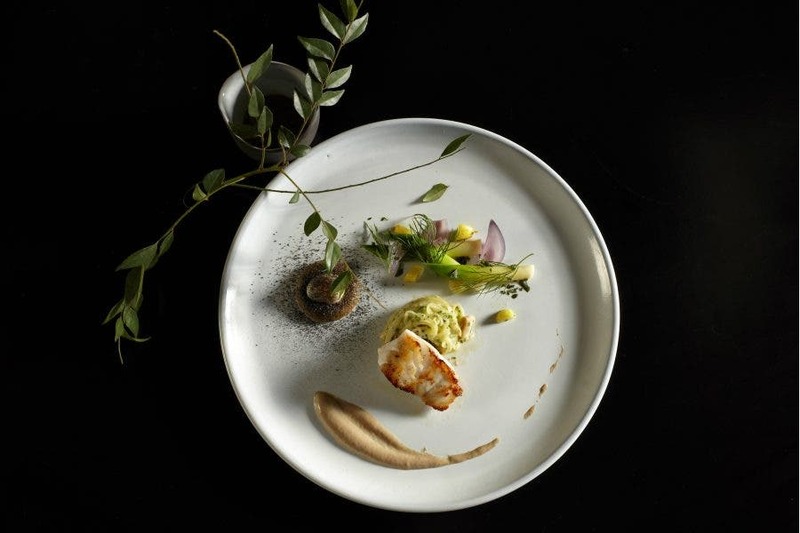 If you’re a globetrotter into fine dining, consider making your next destination Cape Town and its outlying Winelands, where an innovative eight-course tasting menu paired with wines will cost you about $60 to $80 for lunch, and $85 to $105 for dinner. Thanks to the dollar’s strength in South Africa, Americans are in for a feast of value in this scenic foodie haven, ripe with culinary talent and internationally acclaimed restaurants. As for the tasting menus, you can expect the unexpected. You might find poached oysters with lemon, seaweed and apple at La Colombe; Cape Wagyu tongue with gnocchi, celery, carrots and celeriac at Overture; or light curry glazed kingklip (a local fish) at The Test Kitchen, cooked slowly at the table over curry leaves in concrete charcoal-filled bowls, and served with carrot cashew purée and carrot beurre noisette. The Tasting Room’s Tomato and Buchu Tumbleweed. Photo courtesy of The Tasting Room. During the apartheid years, South Africa was shunned and largely cut off from the world, even in a culinary sense. But since Mandela’s presidency, it’s seen an influx of foreign chefs and cuisines. Many South African chefs have also worked in Europe and Asia, and returned all the better for it. Today, Cape Town is a known pit stop on the gastronomic world map. The Test Kitchen, La Colombe and The Tasting Room have ranked in the World’s 50 Best Restaurants, in various categories. Cape Town’s status as a world-class design city has also helped — it was World Design Capital in 2014 — with local talent behind great-looking dining spaces. The Tasting Room’s Joostenberg vlakte duck, with boerenkinders puree. Courtesy of The Tasting Room. The Test Kitchen’s pan-seared linefish with potato and snoek medley, black forest ham and fish jus roasted potato skin. Photo courtesy of The Test Kitchen. Fueling the scene is a flush of small growers and producers, offering chefs great produce, ethically raised meats, wild game, seafood and indigenous ingredients like sour figs, baobab, buchu and honeybush tea, along with a flurry of artisanal products. “Overall, our fine dining feel is quite natural and organic when compared to other countries, with less rigid styling and a trend towards local ingredients and preparations, giving it a sense of place,” says Scot Kirton, head chef at La Colombe. While the feeling is relaxed, with lunchtime guests sometimes even wearing shorts, few of these high-end restaurants are taking walk-ins. The Test Kitchen, ranked 28th in the World’s 50 Best Restaurants in 2015, is currently taking dinner reservations six months in advance, although in August it will switch over to an online 30-day-in-advance booking system. 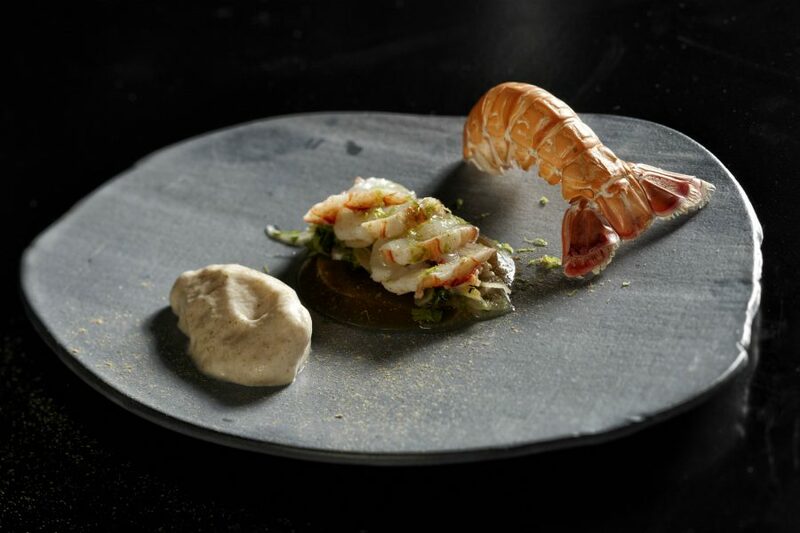 The Test Kitchen’s blinissoise, with chilled blini creme, barbecued langoustine “en gele,” and a langoustine tataki with liquorice powder. Credit: Copyright 2016 Justin Patrick. Wine is intrinsically part of local dining, with the closest vineyards 20 minutes from central Cape Town. While South Africa has a 350-year-old wine heritage, quality has improved dramatically in recent years, and there is a new posse of young and adventurous winemakers. This means great synergy and camaraderie between winemakers and chefs, who are sometimes even on the same property. 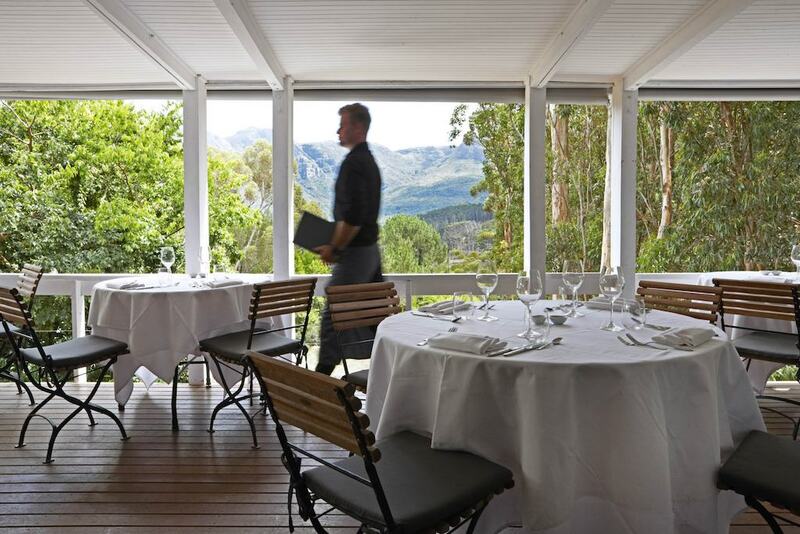 Many of the Cape’s best restaurants are on wine estates, which doesn’t necessarily mean they only serve that estate’s wine; most have extensive wine lists, with excellent wines for as little as $15 a bottle. Despite global influences, many of the best chefs are expressing their personal experience of South Africa. 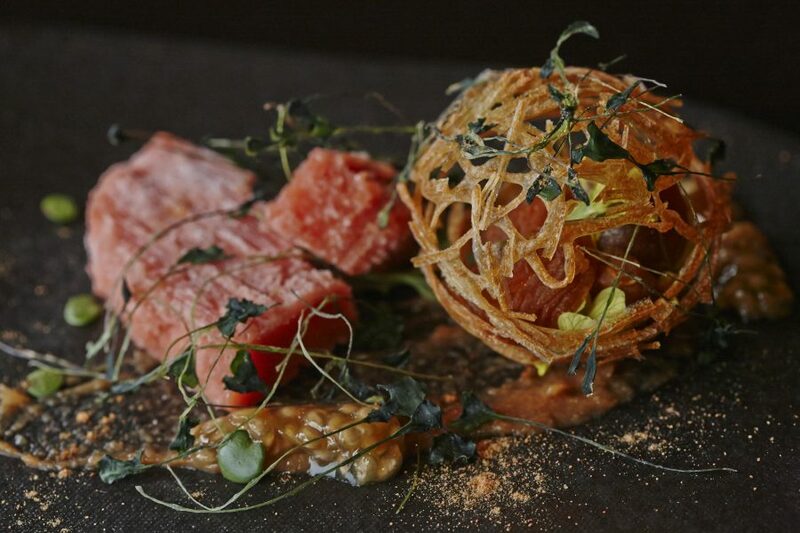 Bertus Basson of Overture Restaurant, on a Stellenbosch wine estate, describes his food as “simple, fresh, seasonal and South African,” and creates dishes like West Coast Memories, with salmon, octopus, sout-vis (salted fish) and snoek. La Colombe, ranked in the World’s 50 Best Restaurants, uses local ingredients. Photo courtesy of La Colombe. Take her Joostenberg vlakte duck dish, for example, which she says “carries many stories.” The duck is farmed in an area where many Dutch settlers grew grapes and produced brandy. Janse steeps mixed fruit in brandy, like it’s done in Holland, but adds buchu — “one of our magical indigenous herbs.” After six weeks, it’s mixed with celeriac in a purée. 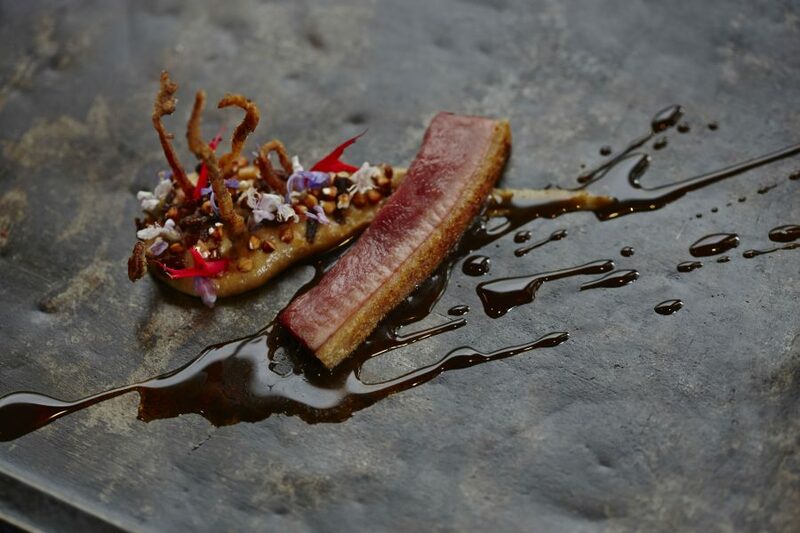 The duck is baked in a salt crust made of hand-harvested Baleni salt mixed with kapokbos, another indigenous herb. The breast is served with the purée and crispy bits of neck and leg, and a grape jus. “It’s about the duck and its heritage,” she says. One dish of many in a new dynamic dining region.